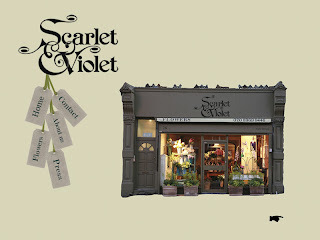 Vic's shop is called Scarlet and Violet and can be found on Chamberlayne Road, NW6. 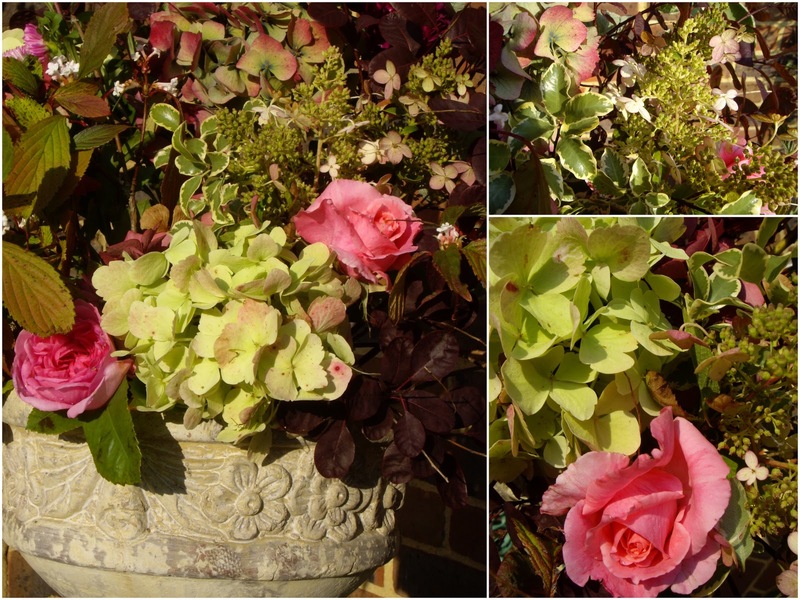 So, feeling inspired by Vic I went out in the garden and snipped away..... here is my creation! I had no idea how much fun it is playing with foliage and flowers and a large lump of oasis. Oh, and for those of you who are worried about my rapid descent into Audrey Forbes Hamilton territory and the world of country wife - yes I was humming Jerusalem and thinking of straining my next batch of blackberry jelly. So pretty, aren't you clever. I've just put this book onto my wishlist, thanks to another blog review - lovely to see your own take on it, and the lovely results so far! had to laugh over blackberry jelly.... brought back some from Country Women's Association shop in Hobart! got to love Audrey, she got everything in the end! have you started your own chapter of the WI? 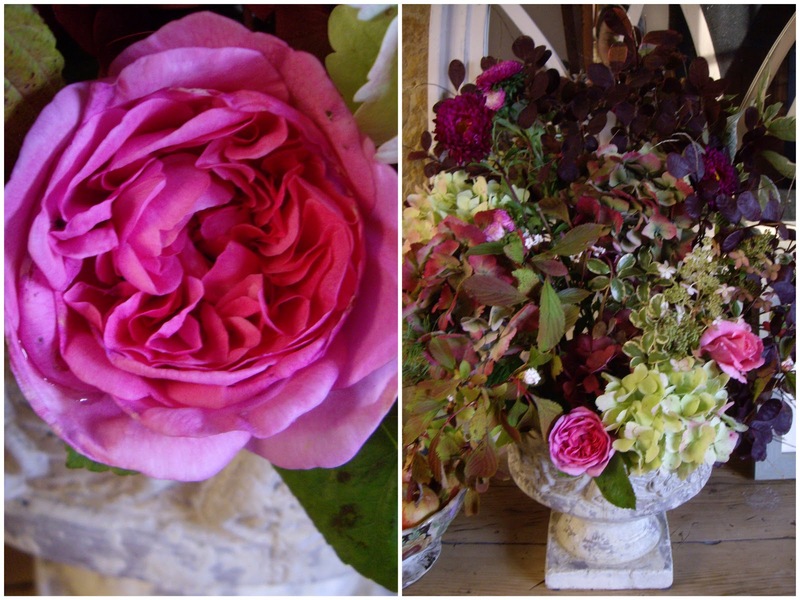 and the flowers look absolutely lovely! and tell the Other P to visit on a saturday if she can, I'll be in the shop! 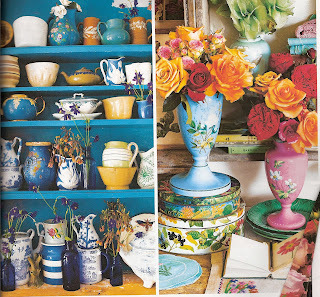 How brilliant Sarah and what lovely images - now imagine an afternoon sipping tea and talking flowers as well....delish. 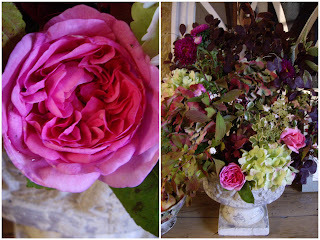 Such a pretty post.....a floral feast!!! Thank you! 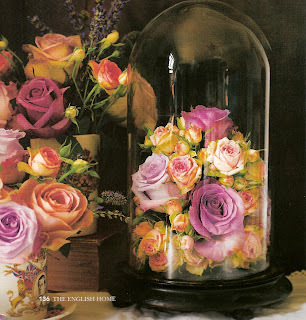 thanks for sharing this its a beautiful post- the flowers and displays are simply stunning! 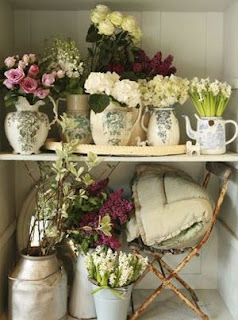 I love that style of flower arranging, so imaginative. Oh dear another must have book! 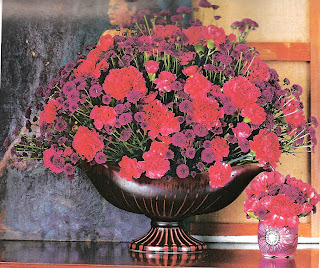 I enjoy flower arranging, very therapeutic. Audrey Forbes Hamilton, one of my all time favourite TV characters! Penelope Keith is brilliant, I liked her in To the Manor Born too. 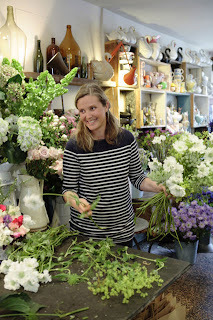 Your flower arrangement looks very professional! 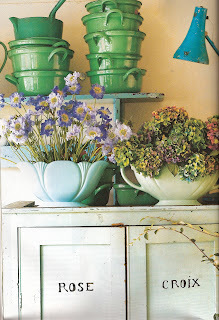 What a lovely arrangement you created-you must not have let the entire day slip away!! Gorgeous flowers, Aud! 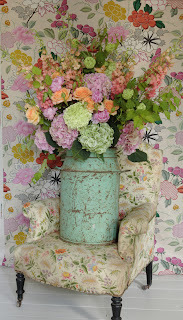 Love the images from my book but quel horreur, I could never stand an urn of flowers on my antique french chair! Sorry, it's YOUR book .. I was merely put it on my mental wish list !! I hardly know where to start SJDTL... 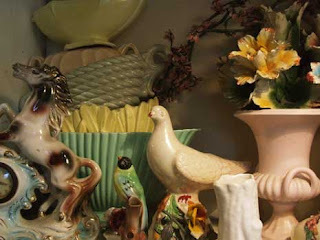 I have had so much to catch up on and your delicious photos are like manna from heaven.. so good for the heart and soul. I am utterly in love with your new home... as you must be too! What a beautiful nest you have made. To see Cornwall through your eyes was almost (not quite) as good as being there myself. We longed for a holiday in the wild west this summer... but alas it was not to be. Tell me this.. how could you wrench yourself away from your new home..? I would be dancing and skipping through the rooms from dawn till dusk..